The race will take place on Saturday afternoon at 19:00 with starting point the Conference Center of Molyvos. The first 1.5 km of the course will take place within the settlement of Molyvos, along the cobblestoned pathways and the decorated courtyards, which will accompany the runners until they reach the highest point of the route, the castle, which is also the first station. Taking the descent upon the asphalt road, we turn right and following the light of the torches upon the path in the forest beneath the castle, the runners will find the second station, which will guide them in the correct direction to the asphalt road leading to Tsipouri, and then to the third station of the race, 3,2 km, near the camp site of Molyvos. 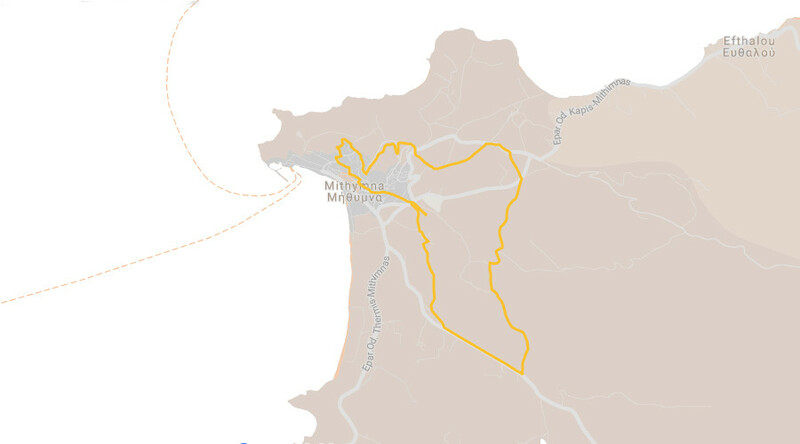 Turning left, the route crosses the plain of Molyvos and at the 5 km mark, the fourth station of the race will again help runners continue in the right direction towards Molyvos. The next part of the race is upon the asphalt road until reaching the fifth station at Karounas, at the 6 km mark of the route, where participants will enjoy the view of the nightlife of Molyvos. On the last path, the torches will once again show the way to the sixth and final station in the woods of Molyvos. The final meters of the race are in Molivos upon the cobblestone road which leads the athletes up to the finish-line, at the Conference Center. At the end of the race, participants will be able to rest and fill up with energy along with their fellow runners participating in the following day’s race at the PASTA PARTY which will take place in the courtyard of the Conference Center!!!! Register now in Lesvos Trail 2017!